Chef Andy Ricker of the bi-coastal Pok Pok empire, is known for his vibrant, flavor-packed larbs. Chef Andy Ricker of the bi-coastal Pok Pok empire, is known for his vibrant, flavor-packed larbs. 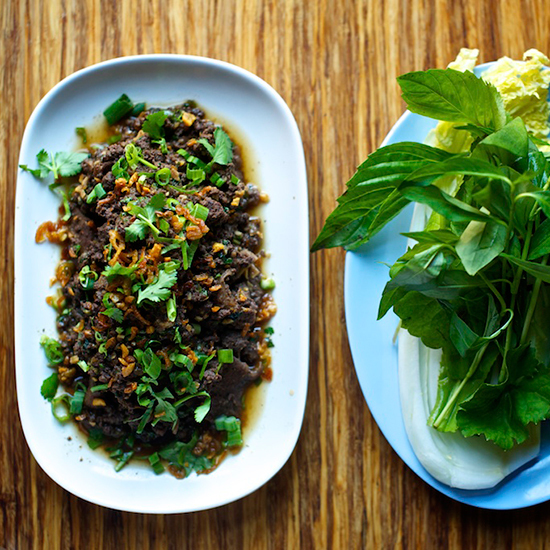 The most popular of the Thai minced meat salads, Da Chom’s Laap Meuang, is a dish he borrowed from a friend’s father-in-law. “A friend of mine who is married to a northern Thai woman brought me to their village and her father made larb for us,” Ricker says. “I was like, ‘Wow! Holy crap this is incredible!’ It didn’t taste like anything I’d ever had. It was complex, very delicious and slightly bitter from the bitter herbs.” Lucky for those of us who don’t regularly frequent small villages near Chiang Mai, he was able to recreate the pungent but incredible dish of minced pork, pork blood and offal back in the U.S. So you only have to go as far as Portland, OR or New York to try it.